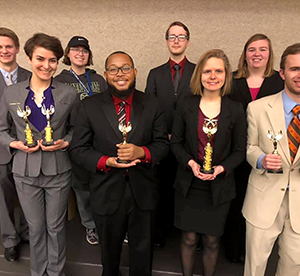 The Highland Community College Forensics Team placed in the top five, earning a fifth place overall team trophy and five individual awards at the Illinois Intercollegiate Forensics Association State Tournament at Northern Illinois University held March 2 in DeKalb, Ill. The IIFA State tournament is often described as one of the hardest, most competitive tournaments all year, as students are introduced to teams from across the state they have yet to come in contact with. Aurand placed fifth in Extemporaneous Speaking and third in Impromptu Speaking, Sophomore Luthien Jonis placed sixth in Dramatic Interpretation, and Sophomore Maggie Finazzo placed second in Dramatic Interpretation and third in Poetry Interpretation. “It was so cool to be back at State and see all the coaches who helped mold me into the educator I am today,” explained Bill Lucio, Public Speaking Instructor and Director of Forensics. The team is scheduled to travel to Prairie State College in Chicago Heights to compete at their Regional Tournament as they continue to prepare for their National Tournament in Reno, NV in April. To see the award-winning speeches and performances the HCC Speech Team would like to invite the public to their Nationals Showcase on Thursday, March 28 from 4 to 5 p.m. in the Marvin-Burt Liberal Arts Center, room M-120. For more information about how to join, support, or donate to the Highland Community College Speech Team, please contact Bill Lucio at bill.lucio@Highland.edu.